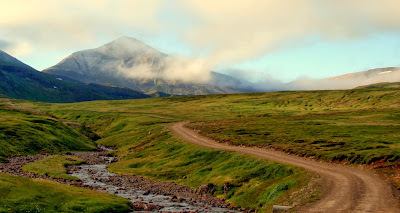 Recently, while considering what to feature in a new post, I asked our Icelandic friend Kári Pálsson if he had written any articles on Icelandic traditions since his essay on “The Valley of the Gods.” He didn’t have a new piece, but he was kind enough to search for an interesting item through back issues of Vor Siður (“Our Way”), the newsletter of the Ásatrúarfélagið (“Æsir Faith Fellowship,” Iceland’s heathen organization). Since writing his last article, Kári has been elected to the Ásatrú group’s lögretta (very roughly translated as “board of directors”). Kári found the following piece by Agnar J. Levy and emailed it to me. I loved it. While seeking permission to translate and post the short article, I found out that Agnar is the father of Jóhannes A. Levy, a friend who has helped me track down Icelandic sources for several articles (including this one). 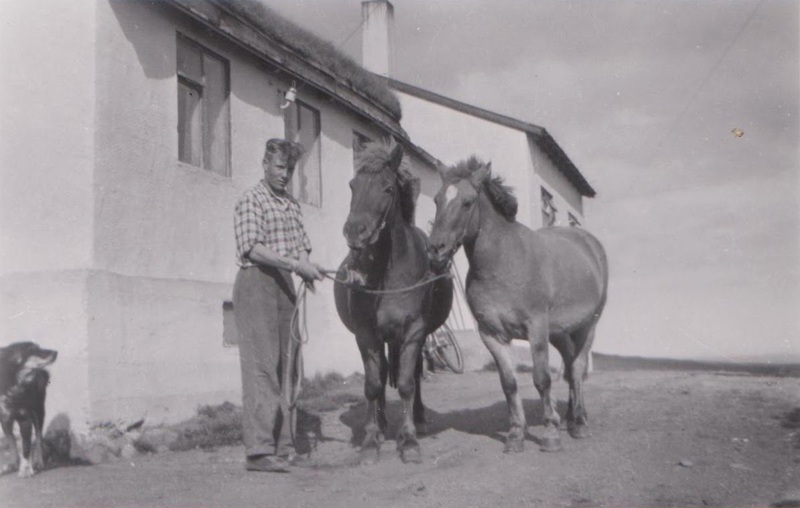 Jóhannes not only gave me permission to post the piece, but he also kindly provided a collection of related information on his father and on rural life in mid-20th-century Iceland. First, here is my translation of the article. Agnar discusses two customs he remembers from his youth on an Icelandic farm – customs that he thinks reflect elements of ancient heathen belief that survived long after Iceland’s official conversion to Christianity in the year 1000. One relates to the prohibition of rune-like ice carvings and the other to leaving a hay-offering for elves or gods at harvest time. It may in many ways be considered remarkable that the old faith survives in the Icelandic national consciousness in many things that have been, as far as I know, little researched. This can be seen in several work practices and activities, or in the worship of ancient gods – both of which were supposedly abolished long ago. Some traditions have survived in the population until recent years but are now fading significantly or are not known by modern people. However, under close scrutiny, there are many such elements still existing that may have changed to some extent but still have the same basis as ancient practice. An example of this is the custom of having a Yule tree and dancing around it. I was born in 1940, and I will now tell of two of the most memorable items from my childhood. The first is that, when we children were playing on ice or in snow, it would often happen that we would carve a variety of doodles on the ice or snowdrift. This displeased the older people, who warned us against this and placed a complete ban on such scrawling. We were told that we would write ourselves to the devil with this scratching. We were never punished for this – the criticism was enough – but I heard stories that children had been spanked in the past to make them obey. Now, much later, when I begin thinking about this in more detail, I think that this could be the remains of the ancient belief in runes. In those days and until recent times, it was considered certain that, if the runes were wrongly carved, they could cause illness or other disaster. I remember examples from stories in the Saga of Egill Skallagrímsson and other sagas. Since it was not easy to stop our idle and futile scribbling, the old devil was mixed up in the matter to make us behave better – and this often worked well. The second example is about harvesting hay in late summer. Many had the tradition of leaving uncut the last little bit of the meadow or a little corner patch. This was called the “elf-rake.” This was to help – or even guarantee – that the grass would grow well the next summer. I remember this here as a child, but the practice has since been completely abandoned. It was not possible to determine if it had any effect the next summer. No scientific study was made, however, since it was self-evidently just a superstition. I think it is obvious that this practice originated in an ancient fertility cult and survived up to the present time, depsite the change of religion. Nobody does such things anymore – or do they? With modern technology and expedited hay harvesting, you will often notice bits of hay accidentally left uncut out in the fields or in the corners. It can therefore be said that the gods still receive their fill, although the farmers give it unintentionally. 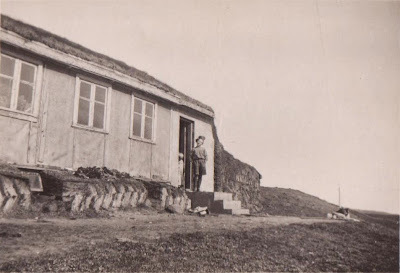 Second, here is what Jóhannes was kind enough to write about his father’s childhood and mid-century Icelandic country life. To those of us who live in urban areas today but have parents who were born in rural areas before the mid-point of the last century, this way of life seems both long ago (historically) and very recent (emotionally). My father’s name is Agnar Rafn J. Levy. 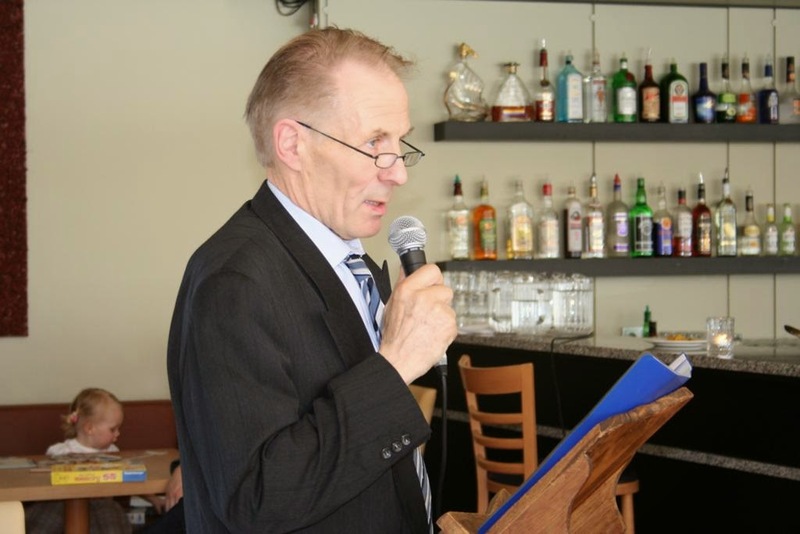 He was born on 30 January 1940, when Iceland was still under Danish control. 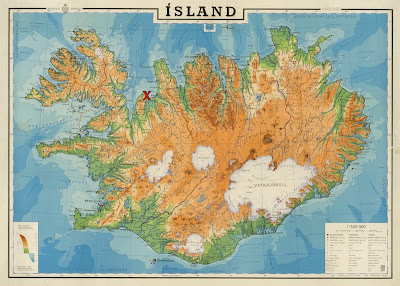 There were approximately only 120,200 Icelanders at that time. The British occupied Iceland 10 May 1940, and their soldiers were more than 25,000 or 20% of the population of Iceland. It would be like having a 600,000-strong foreign army just outside Chicago today. He was born on a farm in northwest Iceland near Húnaflói. His aunt was a midwife in the area, and when she went to help with his birth, she nearly drowned when her horse went down on the ice on the river. She then had to ride seven kilometers [4.3 miles] in winter temperatures. Farms were small and most were for subsistence. All agriculture was conducted manually or with horses; machines were little known. 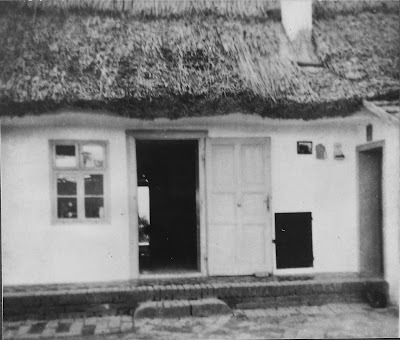 Houses and stables in the countryside were made from various matter (turf, wood, stone), and concrete came much later. Roads were bad gravel road – impassable more or less in the wintertime – and they did not reach every farm in the countryside. 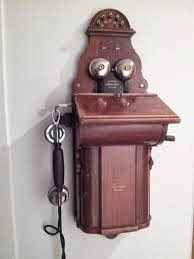 The telephone came in 1947, but not to every farm right away. It was a hand-cranked phone, and the ringing for his farm [before modern telephone numbers] was one long and three short. The telephone line was open to everyone, so everybody could listen to each other. I remember my grandfather listening/spying on his neighbors. Electricity came in 1968, but not at first to every farm in the countryside; some waited six more years. Before that, my grandfather owned a wind-power plant which was widely used to charge the batteries which were used by radios at that time. People came very far in the country to get them charged. This list above is only to describe the circumstances of my father’s childhood. I am so lucky to know the remains of the old time which was quickly fading away. 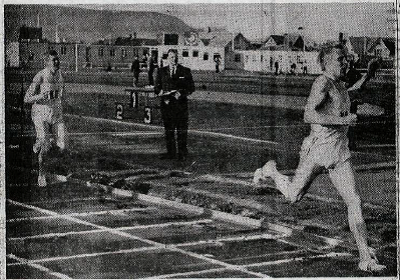 My father was an athlete in his early years and participated in sports competitions, both nationally and internationally on behalf of Iceland. He won some prizes and trophies. Besides being a farmer, he was a chairman of the parish committee and magistrate for many years. He was also involved in many county commitees – Building Committee, School Board, Deputy Accountant for the county, and a few more. He is a member of the Iðunn Society, which aims to preserve the tradition of rímur-chanting. He has composed many rímur and poems. Third, Jóhannes was kind enough to translate this information about a unique photograph of a mid-century elf-rake from the National Museum of Iceland website. Taken nearly twenty years after Agnar’s birth, the photo documents the moment when one of the last survivals of the old practice of leaving a hay-offering to the Powers finally came to an end. 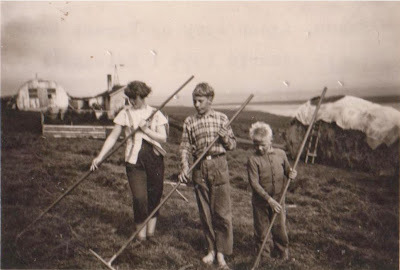 In mid-September 1958, a young man takes a picture when an old tradition is followed for the last time on the banks of the Eyjafjarðará, opposite the farm Hrafnagil. 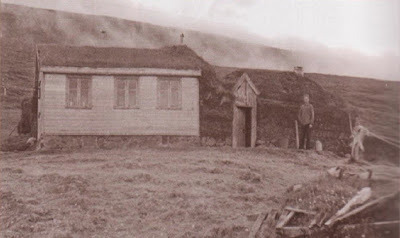 There lies a meadow owned by his father, Jóns Júlíussonar the farmer from Munkaþverá, who lives on the part of the farm that housed a monastery for about 400 years. Making hay in the meadows is done at this time, but only after moving out the last bales on the trailer – seven with each trip. One haystack is, however, left on the field according to old practice – the last one – and Júlíus brought fire to it so it began to smoke. The young man, named Kristján Hans (Christian Hans), is in early twenties at this time. This is truly the last haystack on the banks of the river, as his parents quit farming the year after and move to Akureyri. 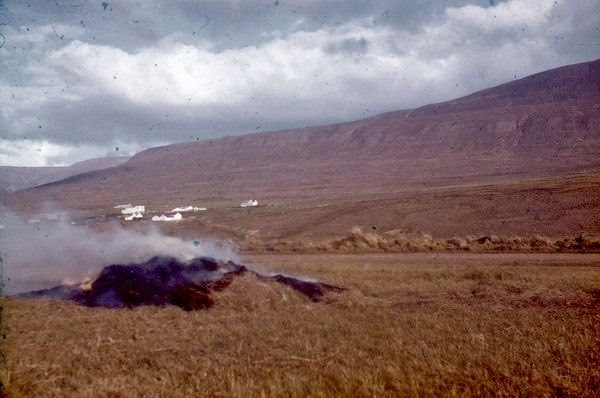 It was a tradition in Munkaþverá to leave the last stack on the banks and burn it, or at least from the time that the family of Jóns began to farm shortly after 1880. This custom was known on several farms in Eyjafjörður. With the new techniques and methods of hay-gathering, this ancient custom died out, probably around 1960. Engjafang (“meadow portion”) was also called dreifarfang (“scattered portion”), englarök (“angel-rake”) and álfkonufang (“elf-lady-rake”). Jóhannes adds that “Icelandic folk tales and fairy tales collected by Jón Árnason say that people should avoid gathering the last hay bundle, or else the hay will not last the winter and grass growth will be less the following year.” As Agnar wrote in his article, these ideas seem to be remnants of an old belief in the importance of offering a portion of the harvest to elves or gods. Finally, Jóhannes made some comments on krumsprang, the word his father used for the etchings he and his friends made on the ice as children. 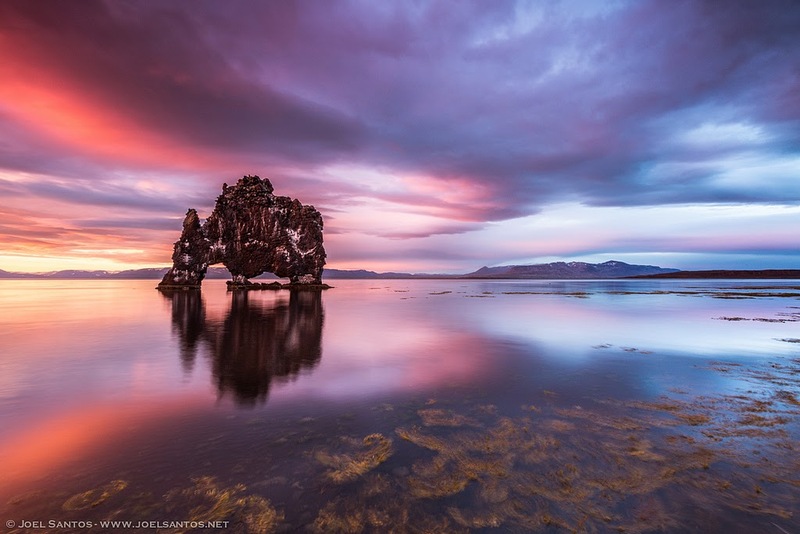 The word krumsprang has been known in the Icelandic language since at least the mid-19th century. The oldest example is from 1854. 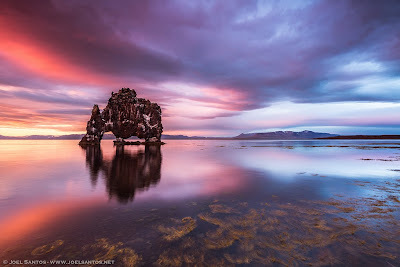 The Icelandic Dictionary (2002) defines it as “ornamental hooks in writing, irregular scrabble.” In the book Íslensk Orðsifjabók (“Icelandic Etymology”), Ásgeirs Blöndal Magnusson states that the noun krumsprang is a loanword from Old Danish, but in modern Danish the word is krumspring. The Danish word is again derived from the German Krumsprung, composed of the words Krumm (“hooked or curved”) and Sprung (“jump or skip”). I say the right translation of the word krumsprang in this case would be doodle. Alles klar! On the advice of Jóhannes, that’s the word I use in the translation. Much of what Jóhannes and his father wrote reminds me of the stories my own father told me of his childhood during the 1930s in Wolfingen, a German farm colony in an area that later became part of Yugoslavia. The town had been settled in the 18th century by Donauschwaben (“Danube Swabians”), Germans who had floated down the Danube to the rich farmland. 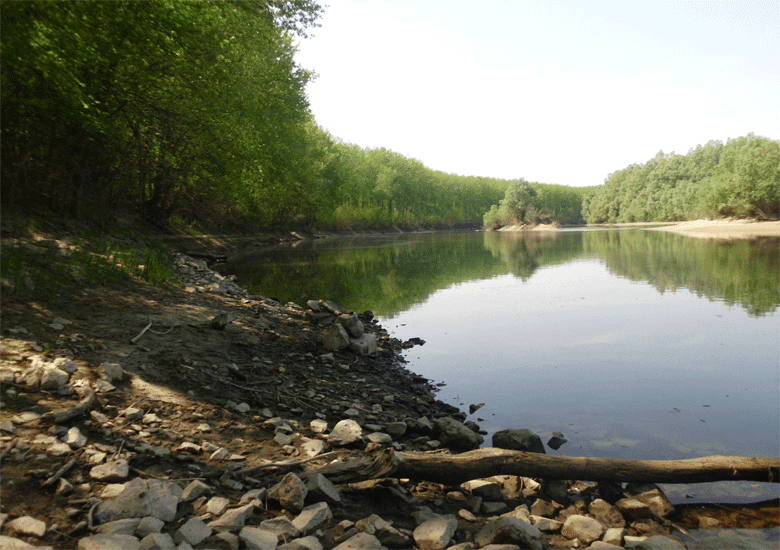 I’ve written about remnants of heathen beliefs in my father’s Catholic village here and here. My dad, like Jóhannes’ father, remembered when his farming village got electricity, when the first automobile showed up, when he first saw so many elements of modern life that we now take completely for granted. His family lived in the oldest house in town – the only one left with a thatched roof. Embarrassed at having an antiquated home, my grandfather planned to tear it down and made a set of bricks to build a new place. The Second World War interrupted his building plans, however, and our family was forced out of their village and into an anti-German extermination camp by Marshal Tito’s Yugoslavian Communist Partisans. My grandparents never saw their birthplace again. Kári has also told me about the wonderful stories he has heard from his grandparents about the old rural ways of living. All three of us realize the great gift we have been given by being lucky enough to have had a personal connection to those who lived in a time that now seems so long ago and far away from modern urban life. 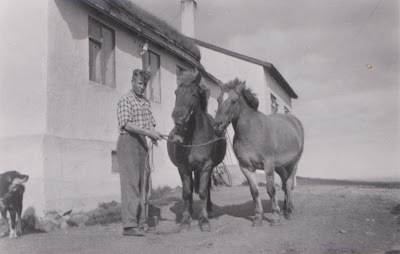 Jóhannes’ father is still working on his farm today. Kári recently lost his grandfather, but his grandmother continues to tell him stories of her youth. My own father died on my birthday in 2006, so I can’t ask him all the questions I still have about life in the old country. I have to cast my memory back and try to piece together elements from all the stories he told me around our kitchen table when I was growing up. If you have people in your own family with stories to tell, take time now to listen. If you don’t learn the family traditions and pass them on to your own children, this beautiful heritage of oral tradition will be lost forever. "If you have people in your own family with stories to tell, take time now to listen. If you don’t learn the family traditions and pass them on to your own children, this beautiful heritage of oral tradition will be lost forever." Well-said. My Bestefar is #5 of eight children born to my great-grandparents who emigrated from Norway. 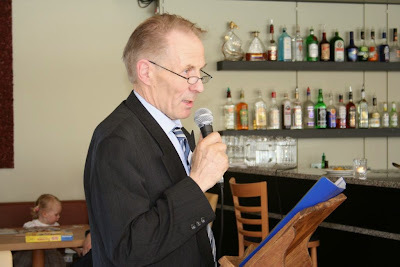 I could sit and listen to him tell tales of his parents' lives all day, and in fact I do, especially on Krumkakker Day. Before the family Yule gathering, I go to my grandparents' house and make krumkakker with Bestefar for the family to enjoy. It's wonderful. The practice to leave the corner of the Field uncut was also an old custom in Germany. It was called Sleipnirs fodder, as they expected Wodan to come soon, as he was the Winterking, god of the Wintersolstice .